Have you watched Dr. Horrible's Sing-Along Blog yet? No? Then go. Now. Then come back read this. Then go watch How I Met Your Mother. Please. Seriously, it's amazing. The music, the everything is unbelievably awesome. If you love Neil Patrick Harris, Barney, or Dr. Horrible you're guaranteed to love it. 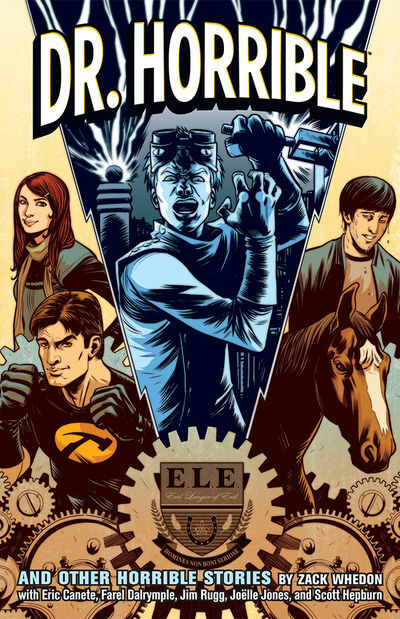 The comic book goes along with the blog, covering the back story of all the characters and giving us more of Dr. Horrible and his humble beginnings in the world of evil villantry. Bad Horse and his choir of men make an appearance as well as Moist, Penny, Captain Hammer, his groupies, and a bunch of other evil villains that are mentioned on the blog.